Consider this. Would you rather live a life filled with ups and downs, joy and sadness, frustrations and pride and surprise? Or a life that goes along, one day after another, with few disruptions or changes or shake-ups? Choice 1 might seem scary; a little like a roller-coaster ride. On the other hand, Choice 2 might seem a little disappointing. Don’t get me wrong, they are both mixed bags. The roller-coaster can deliver some shocks to the system, and it can be hard to sometimes feel that you are not in control of everything in your life. If you are living without the emotional disruptions and shake-ups, you may feel “safer” and more in control of things, but you may also find yourself feeling bored and unstimulated. As a psychologist, I have come to realize that people living in the Choice 1 scenario are typically overall happier. That’s because if you are on the roller coaster, you are living life in a more powerful way. You are more connected with your emotions, and so you are probably far more fulfilled. Choice 2 is a sign that you are disconnected from your feelings. Probably you grew up in an emotionally neglectful family. Probably you learned at an early age that your emotions were irrelevant or burdensome. Probably you have walled off your feelings as a coping mechanism. No doubt, though, the way you are living seems normal to you. After all, it’s the way you have always lived. It’s probably the way you were raised to be. So how do you know if you’re emotionally numb? You can go through happy life events without feeling as happy as other people seem to be when they have similar happy events. I have had countless patients in my psychology practice describe their joyful life experiences as bland. Some have gone through weddings, vacations, graduations or award ceremonies feeling as if they are watching themselves from afar, disconnected from the experience, or even waiting for it to be over. They feel numb. You sometimes wonder why you don’t feel sadder when faced with loss. Similar to above, it’s possible to go through a funeral of a loved one or a job layoff and feel little. Your brain knows you should be sad, but your body does not feel it. You are numb. Your primary emotion is anger or irritability. Unfelt feelings, or walled off ones, have a tendency to all pool together into one big soup. Denied and pushed down or away, the individual ingredients (your emotions) blend to make one big one. This big one is likely to be anger. Anger is powerful and can break through your wall more easily, so it becomes the primary feeling you feel. So you essentially have two emotional states: angry or numb. It’s hard for you to identify any particular feelings. One of the effects of walling off your emotions is that you lose touch with them. When you’re disconnected from your feelings, you’re not thinking about them or noticing them. If you ever need to explain how you feel, you stammer or clam up. You go numb. You can observe yourself in certain situations, and wonder why you’re not feeling something more. Others around you are crying tears of joy or sadness. You look at them and wonder, “Why don’t I feel that? What is wrong with me?” You realize that you are numb. You are often uncomfortable when other people have strong emotions. When you find yourself in a situation where others are having feelings, you may have one yourself: uncomfortable. All you want to do is get away from this situation that seems awkward and unnatural. Unlike them, you feel numb. You are sometimes envious when other people have strong emotions. Unfortunately, you can’t give up your negative feelings without also giving up your positive ones. When pain, anger, and sadness go out the window, they tend to take your love, warmth, and joy with them. You see others experiencing those wonderful emotions, and you may wish you could too. Sadly, you cannot. Instead, you are numb. You sometimes feel like you’re going through life on autopilot. One foot after another, you march along, doing what you are supposed to do, and probably doing it well. Like a toy soldier or an energizer bunny, you just keep on going. But you also find yourself wondering what it’s all for. Shouldn’t you be something more, you ask? The answer is yes. There should be highs and lows, pride, joy, and sadness, but you are missing it because you are numb. You feel more when watching a movie, TV show or commercial or reading a book than you do in real life. For those whose feelings are tamped down, it can be easier to access them when it’s safe; when it’s not personal; when it’s not you. You can feel the emotions of a fictional character or someone in the news, but you can’t feel your own. When it comes to your own life, you are numb. You occasionally feel empty inside. This is the ultimate sign. Your “empty” feeling may reside in your belly or your throat, or it may be just an uncomfortable sense that something is missing in you. That sense is your body telling you that what should be filling you, connecting and energizing you — your emotions — is not there. This is your body telling you that you are emotionally numb. If you see yourself in any of these 10 signs, do not despair! There are answers. Your feelings are not gone. They are still there, inside you, waiting for you to reclaim them. You can break down the wall that blocks them, and welcome them back into your life. Bit by bit, slowly but surely, in a way that feels safe and healthy, you can reverse your numbness, and fill your life with color and energy. Growing up with CEN you were taught to ignore and marginalize your own feelings. But now that you’re an adult, you don’t have to continue that. You can welcome your feelings back into your life and learn the skills to manage and use them. 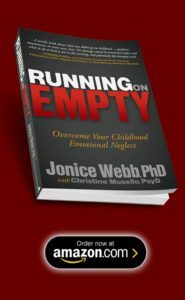 You CAN overcome your Childhood Emotional Neglect. 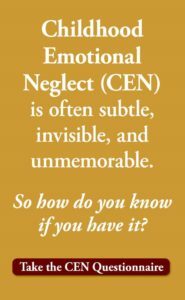 For help, Take The Emotional Neglect Test. When you sign up for the free test you will also receive my free newsletter which is chockfull of helpful information. I’ll let you know when my free CEN Recovery Videos start. 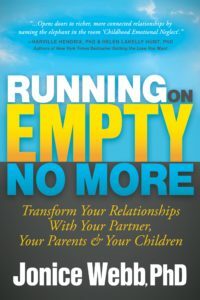 For even more help into and through the CEN recovery process see my two books, Running On Empty: Overcome Your Childhood Emotional Neglect and Running On Empty No More: Transform Your Relationships With Your Partner, Your Parents & Your Children. Do you have other known therapists who would be local for me? Or are your findings something that only you have experience in? I would love to help those like me, and I am looking for a passion to take on. This will help. Hi Brittney, check out the Help drop-down on this website. There’s a list of CEN therapists all over the world. There may be one near you!